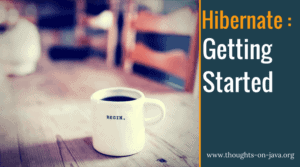 JPA and Hibernate support a set of hints which you can use to provide additional information to your persistence provider to influence the execution of a query. You can use them for lots of different things, like setting a timeout for your query, using an entity graph or defining the caching of a query result. But before we start with the list of hints, let’s have a quick look at how you can use a query hint. You can provide it to the EntityManager.find method, the Query interface for named and ad-hoc queries or the definition of a @NamedQuery. The only sad thing about this is that the syntax for each of them is a little bit different. The EntityManager.find method accepts a HashMap<String, Object> as an additional parameter to provide the hints. The Query interface provides the setHint(String name, Object value) method which you have to call for each hint you want to provide. And you can also provide hints to the @NamedQuery annotation to add them to the definition of the named query. In this case, the hints will be used for each instantiation of this named query and you don’t have to set them on the Query interface. This hint defines the timeout in milliseconds to acquire a pessitimistic lock. The javax.persistence.query.timeout hint defines how long a query is allowed to run before it gets canceled. Hibernate doesn’t handle this timeout itself but provides it to the JDBC driver via the JDBC Statement.setTimeout method. The retrieveMode hint supports the values USE and BYPASS and tells Hibernate if it shall USE the second-level cache to retrieve an entity or if it shall BYPASS it and get it directly from the database. This hint defines how Hibernate shall write changed entities to the second-level cache. It can either USE the cache to add entities to the cache and updated existing ones, or BYPASS it for entities that are not already stored in the cache and only update the existing ones or REFRESH the entities located in the cache before they get retrieved from it. The javax.persistence.loadgraph hint allows you to provide an entity graph as a load graph to the query to define eager fetching specifically for this query. You can read more about entity graphs in JPA 2.1 Entity Graph – Part 1: Named entity graphs and JPA 2.1 Entity Graph – Part 2: Define lazy/eager loading at runtime. You can use this hint to provide an entity graph as a fetchgraph to a query. 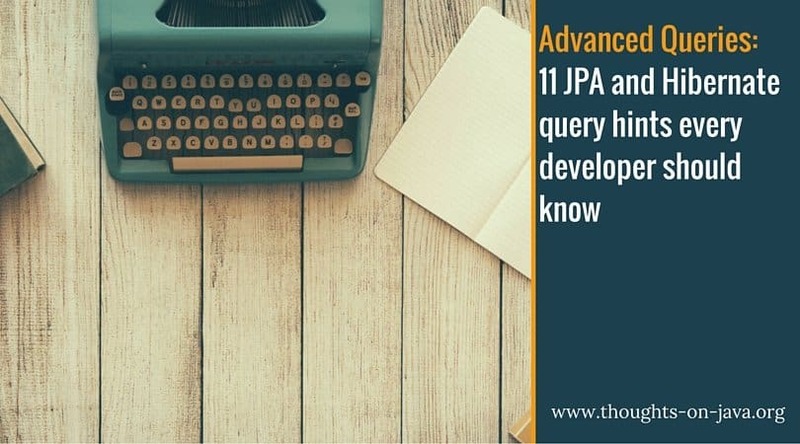 These were the most important query hints defined by the JPA specification. Let’s continue with the Hibernate-specific ones. MANUAL = you have to flush the Session yourself. If you will not apply any changes to the selected entities, you can set the org.hibernate.readOnly hint to true. This allows Hibernate to deactivate dirty checking for these entities and can provide a performance benefit. Hibernate provides the value of this hint to the JDBC driver to define the number of rows the driver shall receive in one batch. This can improve the communication between the JDBC driver and the database, if it’s supported by the driver. If you set the hibernate.use_sql_comments property in your persistence.xml file to true, Hibernate generates a comment for each query and writes it to the log file. This can be useful, if you have to analyze huge or complex SQL logs. You can use the org.hibernate.comment hint to provide your own comment for a query. If you want to use Hibernate’s query cache, you have to activate it in the persistence.xml file and enable it for a specific query by setting the org.hibernate.cacheable hint to true. As you have seen, JPA and Hibernate provide a set of hints which you can use to customize and optimize the execution of a query. Especially the ones related to caching and entity graphs can provide huge performance benefits to your application. Thank you very much for this interesting article ! Ooops, thanks for pointing out.